If there’s one thing that could tamp down the excitement around localized mobile advertising, it is the usability issue: it’s not easy to deliver the right message to the right person at the right time. And Google has just proved that point with its new sponsored search results on the iPhone. 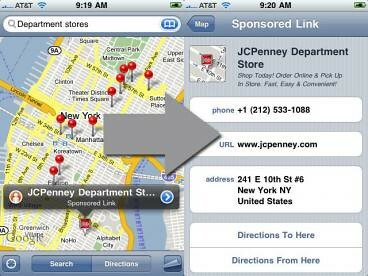 Starting this week, Google’s iPhone maps program features sponsored links that point users to nearby locations. The trouble is, it doesn’t work. In addition to the larger mobile ads that I wrote about this week, Google has started inserting sponsored links into its local search results on the Google maps program on the iPhone. JCPenney has a right to be upset if if it’s paying Google for location based advertising only to have users sent to a completely unrelated location. But that’s not the only usability issue with this new feature. Many advertisers are eager to tap into the potential of location based advertising. But localized mobile advertising is only as good as its utility and ease of use for the user, and unreliable ads that give out the wrong information are neither of those things. It’s one thing getting excited about bringing useful information to consumers wherever they are, but local advertising also increases the variables — and the room for error — exponentially in delivering the right message to customers. Of course Google will continue to improve its methods and tailor these ads. But if users go off in the wrong direction after following a directive from Google maps, they are less likely to return to find that out. How did AMC’s Mad Men Yourself get everywhere? AMC’s “Mad Men” has come a long way since suspending the Twitter accounts of fans who were tweeting from the perspective of the show’s characters. In the lead up to the third season of the show, “Mad Men Yourself” avatars were an unavoidable presence in social media and elsewhere online. Ian Schafer, CEO of Deep Focus, led the campaign and spoke at the Social Ad Summit today in New York about how the campaign came together and exactly how much traction it received. Online auction giant eBay recently announced that it has generated $380m in sales through its mobile commerce channel, showing the potential value of m-commerce for retailers. The figures are interesting, especially as other large retailers such as Amazon have yet to reveal their mobile commerce sales, and shows that enough shoppers are prepared to make purchases on their mobiles to make it worthwhile for retailers. Being first to market in the iPhone App Store may have helped a lot of brands sell their products, but with over 1 billion downloads already under its belt, that option is no longer available. So how do companies get people to buy their app when the space they cover is already well represented in the store? In the case of Men’s Health, they released a drinking app. And sat back as over 50,000 people downloaded “Jimmy the Bartender” in its first month.